Seuls. Singular Moments in Belgian Film History is a series of film programs hosted by Sabzian at KASKcinema. These programs are accompanied by the publication of unique texts by Belgian filmmakers and writers on Sabzian’s website. 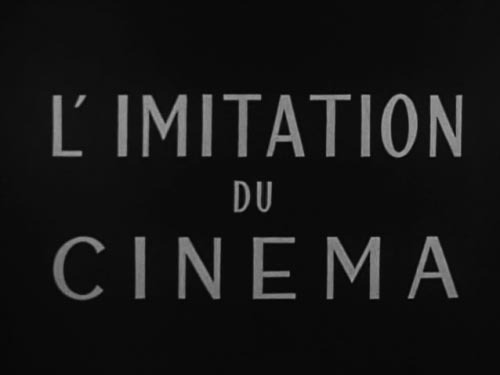 It is often said that cinephiles don’t know or are rarely appreciative of their own national cinema. Film critic Adrian Martin “observe[s] a very intriguing dimension of cinephile thought: namely, the usually feisty way it negotiates a fraught relation with the cinephile’s own national cinema. Indeed, I sometimes think I can spot a cinephile by the intensity of their hatred for their national cinema.” With this series of film evenings, Sabzian aims to chart the wayward landscape of Belgian cinema with images, sounds and words, by means of an affectionate countermovement. For the third Seuls program, Sabzian will show a compilation of short films that are intimately connected with surrealism: Fleurs meurtries (Jean Calvel & Roger Livet, 1930), Monsieur Fantômas (Ernst Moerman, 1937), Magritte ou La leçon de choses (Luc de Heusch, 1960), L’imitation du cinéma (Marcel Mariën, 1960) and La pluie (projet pour un texte) (Marcel Broodthaers, 1969).